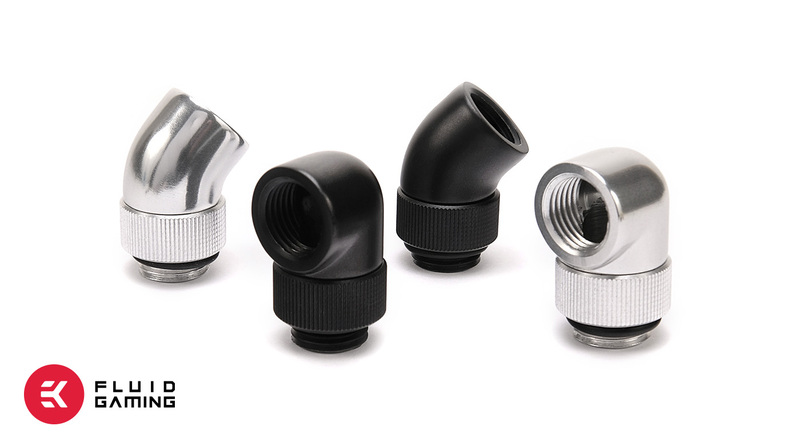 The introduction of all aluminum liquid cooling parts to the market can easily be connected to the invention of diesel engines for cars. Sure, it’s way more cool to have a sports car packed with horsepower that runs on petrol, but it does not mean you cannot have a nice pimped diesel car that is cheaper to fill up. 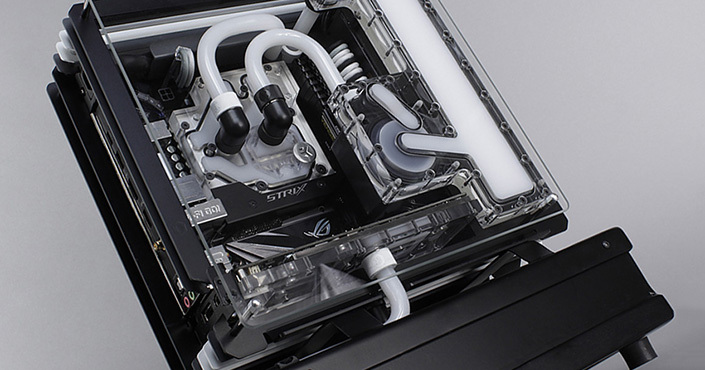 Same goes for the new Fluid Gaming aluminum kit lineup, it’s cheaper, does the job just as good and it still looks awesome. So why are some of the folks still upset? But so does copper. Ever seen dark stains on your copper water block? That is copper oxidation, and oxidation is a form of harmless corrosion. The thing you want to avoid in your liquid cooling loop is galvanic corrosion! Whenever someone says the word “aluminum” in the liquid cooling community, there is always that guy that will scream that it’s bad, because it will corrode, and by that, he is not even specifically referring to galvanic corrosion. So whats up with that? What is galvanic corrosion and why does it happen? Galvanic corrosion is an accelerated form of corrosion, in contrast to oxidation. It is an electrochemical process that occurs when two metals with different electrochemical activity are in contact with each other (like copper and aluminum). The more noble, passive metal (copper or nickel) drives the corrosion of the active, less noble metal, where the passive metal remains fairly unharmed. This process will go on until the active metal is completely destroyed or the process would stop when the electrical connection between the two metals is canceled. Since we are talking about liquid cooling here, an electrical connection is always present through the coolant. 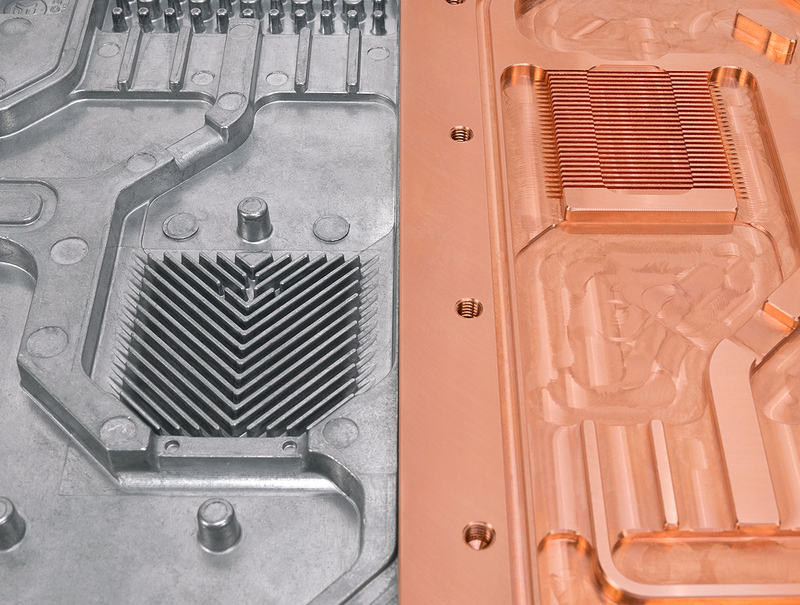 The base of the problem in liquid cooling is when you mix copper or nickel plated copper with aluminum parts, where the aluminum is the much more active material. 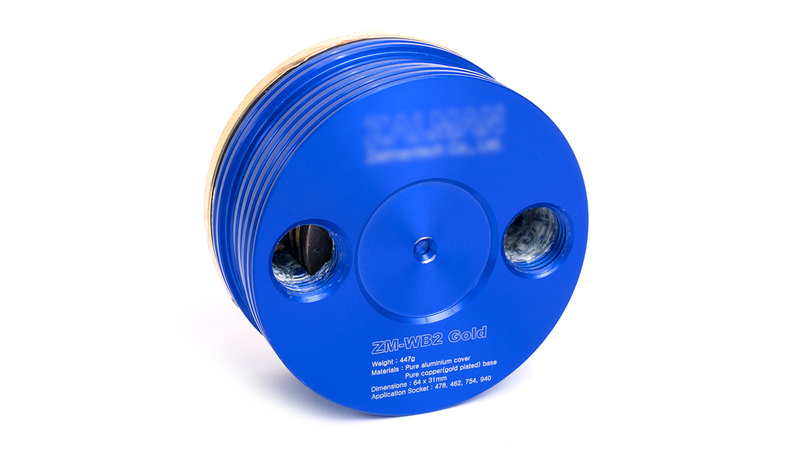 But, galvanic corrosion does not occur only with liquid cooling loops, one example is when you connect aluminum frames with steel screws. In a humid environment, the steel screws will drive the corrosion of the aluminum which is much more active. Also, if you are using aluminum pop-rivets on steel parts, expect the rivets to give up after a while, especially if it’s exposed to humidity and rain. 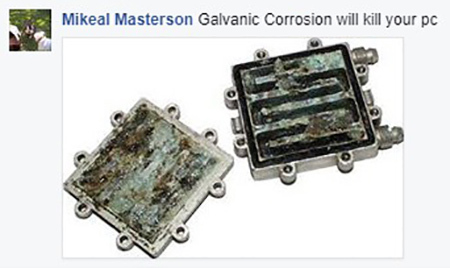 The issues of mixing different types of metals are very precisely documented in the engineering textbooks, it’s kind of important to point out that the occurrence of galvanic corrosion is not a new thing invited by liquid cooling enthusiasts. When the two types of metal are in contact with each other and are covered with an electrolyte (water), then the more active metal (like aluminum) becomes anodic, and the passive metal cathodic. It is always the anode, the less noble material that corrodes and dissolves into the electrolyte. The electric potential difference between various types of metals is what drives the accelerated corrosion as a flow of electrons from the anode to the cathode. The bigger the cathode area is in relation to the anode, the faster the active metal will corrode. This same galvanic reaction is used in batteries to generate potential difference (voltage), or should we say electricity. Low-cost batteries typically contain carbon-zinc cells. The zinc inside the battery cell will corrode as it is an essential process of the battery producing electricity. By reading this far into the article, you are quite aware that having aluminum or zinc in your regular copper or nickel plated liquid cooling loop is not a good idea. Do you want to see how does galvanic corrosion look like? Above is an example of the fairly old CPU water block, where the base is made of gold plated copper and the top is made of aluminum. As you can see, the copper cold plate is unharmed, there are no corrosion cavities or any other visible physical damage, only the thin layer of gold plating peeled off. On the other hand, the aluminum top shows heavy signs of galvanic corrosion, with deep cavities and white corrosion stains. 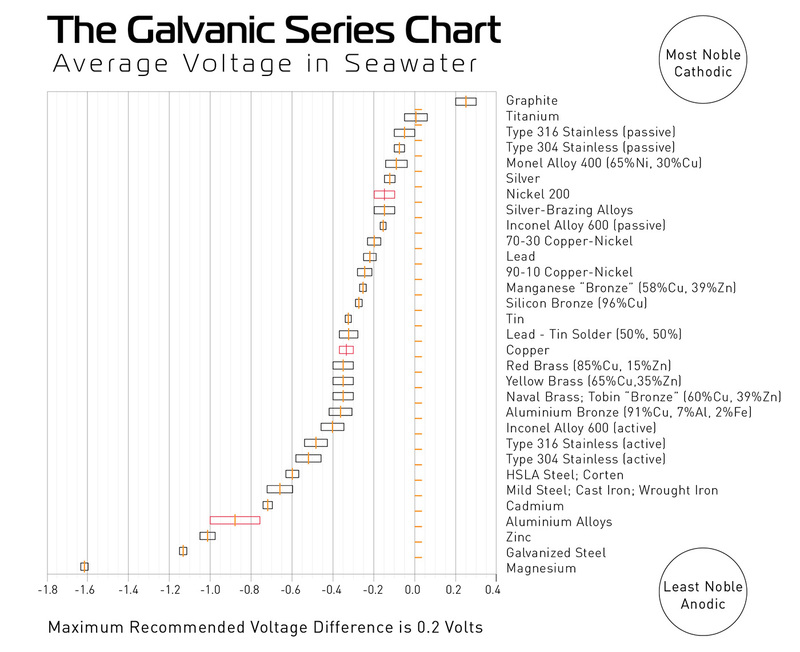 You can prevent galvanic corrosion by simply not mixing various types of metals, or by picking metals that are close to each other from the Galvanic Series Chart. As you can see copper and nickel (marked with red) are quite close to each other, while aluminum (also marked with red) is a bit far away from them on the chart. 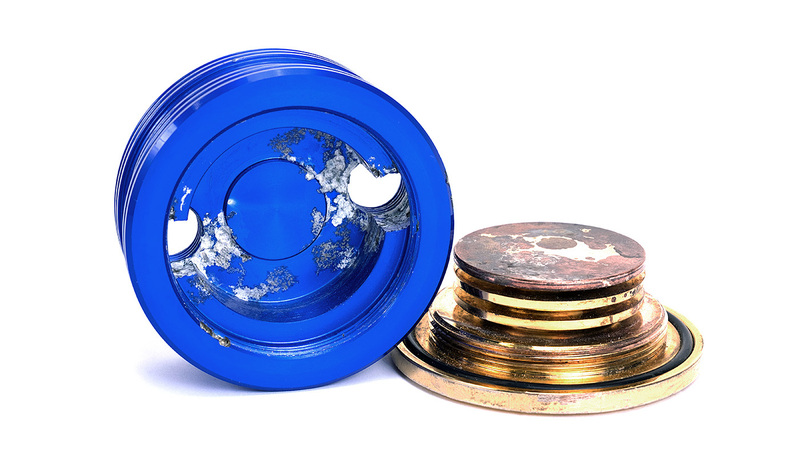 Mixing copper and nickel in a liquid cooling loop with aluminum parts will induce galvanic corrosion and the more active aluminum will get damaged. 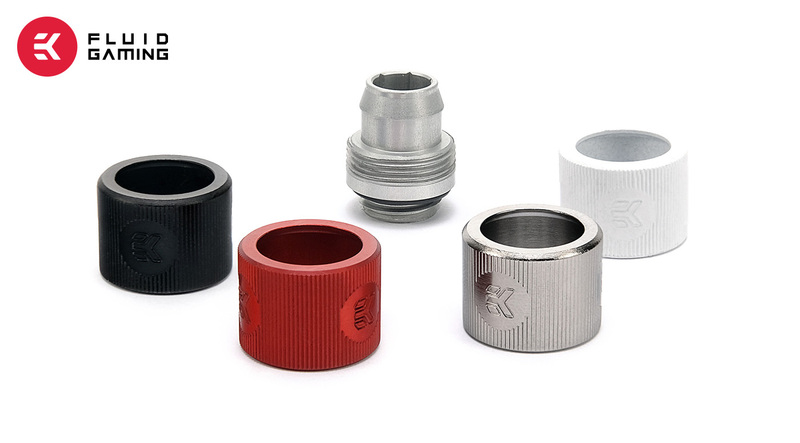 This can also lead to the damage to the nickel plating since it is a thin coating. Corrosion happens regardless in all systems whether they have mixed metals or not. The speed of the corrosion depends whether there are metals mixed in the system, the thickness of the material layer (coatings) and other environmental factors. The rate of corrosion can be reduced almost to a halt by not mixing metals that are far away from each other on the Galvanic Series Chart and by using anti-corrosive additives in coolants. 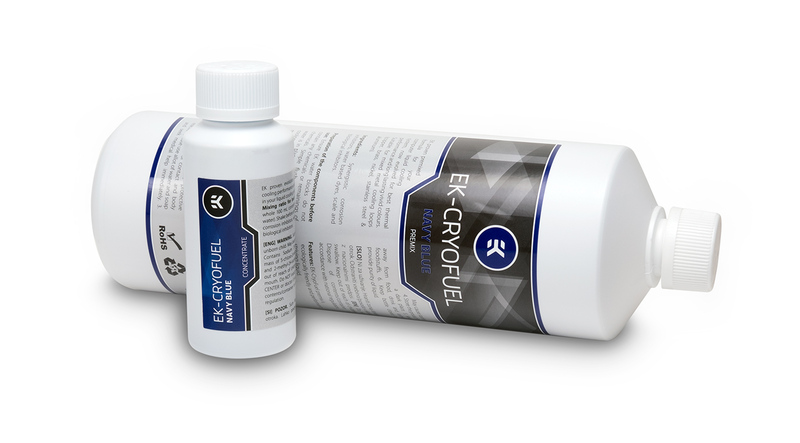 This is why we recommend using pre-bottled purpose made coolants, like EK-CryoFuel, for liquid cooling systems. Purpose made coolants contain all the necessary chemicals to protect your parts from corrosion and biological growth like algae. 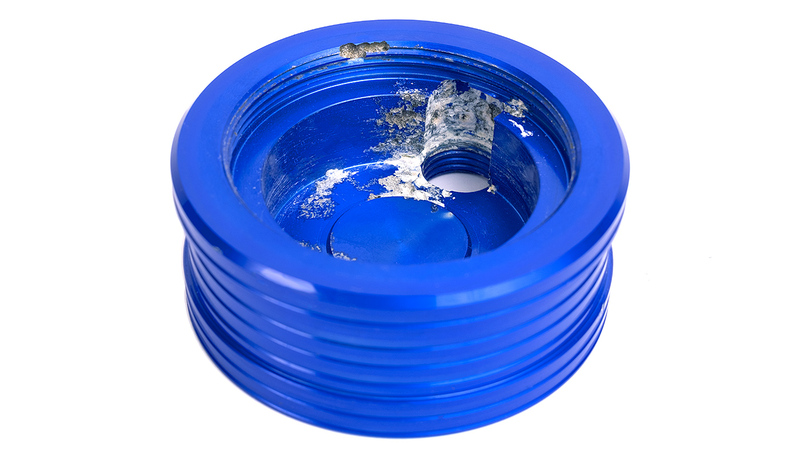 Bottom line, the horror stories you have heard about aluminum and corrosion will only occur in real life if you have mixed aluminum and copper or brass (or nickel plated version of both) parts in the same liquid cooling loop. The wall of text about galvanic corrosion would not even be needed if users and manufacturers would simply follow the laws of physics. Now that we covered the part about galvanic corrosion in depth, we shall move on to performance. There are also fierce debates about the performance with aluminum opposed to copper. And this is entirely true! You can all check the thermal conductivity of various materials, the charts are very accessible. The thermal conductivity of pure copper is 401W/m²K while pure aluminum is rated at 205W/m²K. You don’t even have to know what W/m²K means, you can spot that the value for copper is almost two times higher. If this is true and if this is the only factor that needs to be taken into account when talking about cooler performance, why don’t we see more copper based air coolers? Why do the majority of air coolers have aluminum fins rather than the whole heatsink being made of copper? The reason for this is that for cooling purposes, much of the workload is done by the cooling medium. 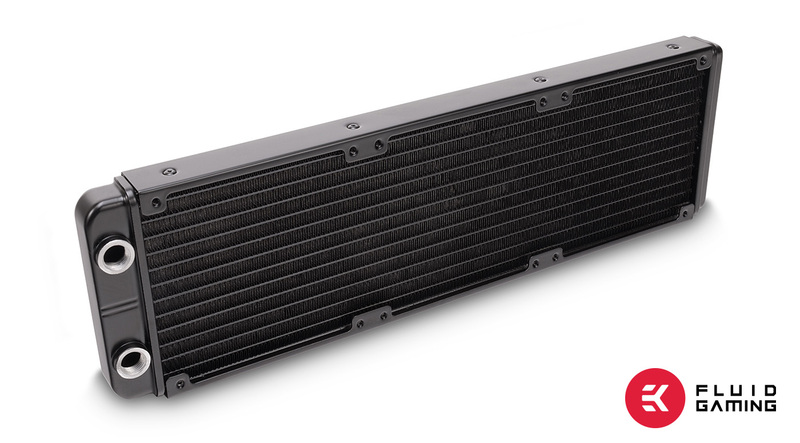 In the case of air coolers, it’s the air, and for liquid cooling, it is the coolant. The reason why liquid cooling is superior to air cooling is the high efficiency of the coolant to pick up and give off heat. The thermal conductivity of atmospheric air is 0.024W/m²K and for water, it is 0.58W/m²K. One more limiting factor for cooling is the thermal conductivity of the silicon chip itself, which is around 100-120W/m²K. You can spot that the difference between thermal conductivity of air and water is huge (air – 0.024W/m²K, water – 0.58W/m²), it is off by a decimal. If we look at things from that perspective, the difference in thermal conductivity of copper and aluminum is not all that big, right? The difference thermal conductivity of copper and aluminum would be more significant if we were to transfer heat through a one meter long slab of metal. Since the water block is fairly thin, whether it was made of copper or aluminum, the main limiting factor in performance is the thermal conductivity the heat transferring medium, which is air or water. Anyone can Google search test results of the legendary Thermalright Ultra-120 True air cooler which came out in a full copper version as well. The all copper version of the air cooler never performed twice as better than the version which used aluminum fins, it was always only a few degrees ahead… interesting, right? So while copper has twice the thermal conductivity than aluminum does, using aluminum water blocks will not bisect the cooling performance. 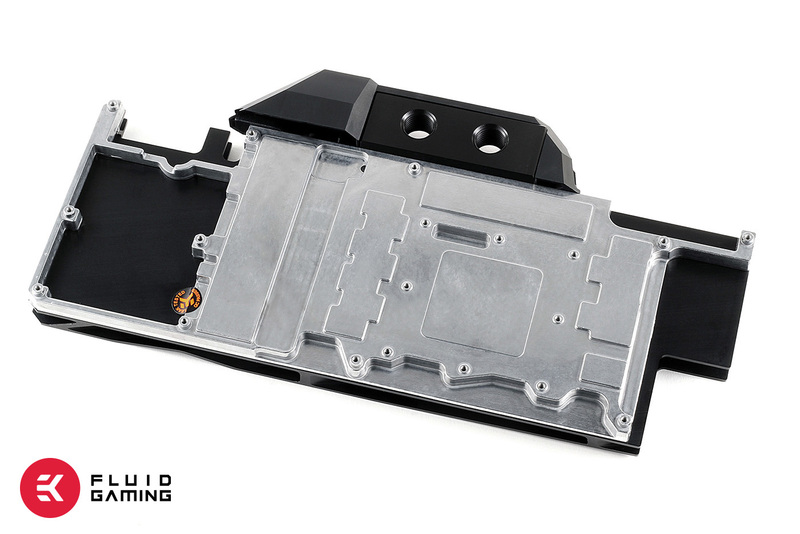 There are warning labels on all EK Fluid Gaming water blocks that warn the user about mixing liquid cooling parts. There is a big warning label when you open the kit box. There is also a label on your car which tells you which type of fuel it uses… and we still have people occasionally pouring petrol in their diesel cars. There is only so much we can do to educate and warn the users about the consequences of mixing different metal-based cooling parts. 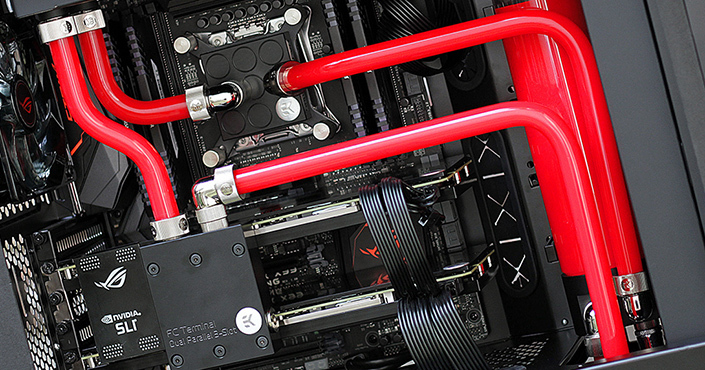 Don’t mix aluminum and copper (or brass) based liquid cooling products! This article is great and filled with useful information. 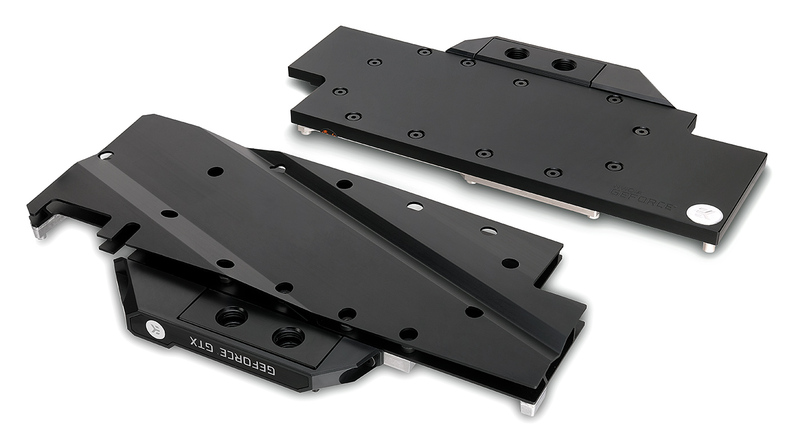 I do have one question, why did you guys make the water block built into the ROG Maximus X Formula a mix of galvanized aluminum and copper? Makes perfect sense. Just got mine in the mail, will see how it goes. One question – why is it so much cheaper to use aluminum? For example, copper is $3 per pound, vs $1 for aluminum. So you save less than $2 in raw materials – is there some other reason? Obviously, you keep margins on the other kits, but for it you need a whole new manufacturing line. 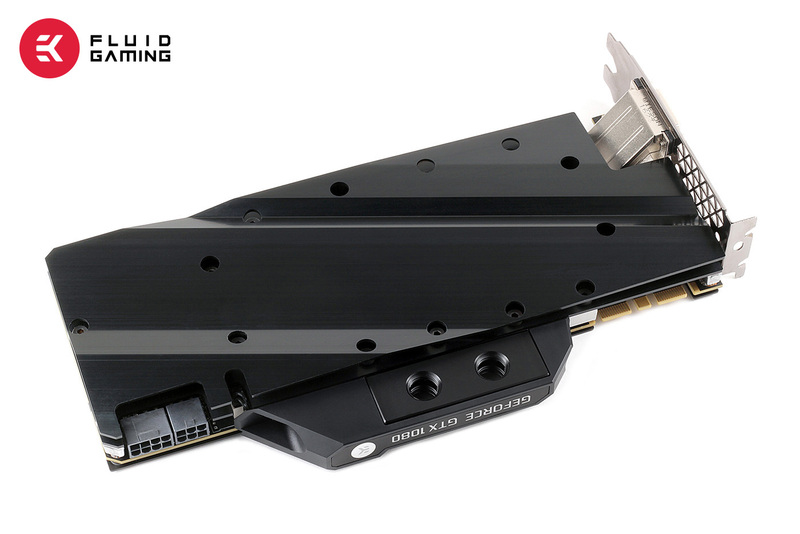 If I could have gotten a copper GPU kit for $300 I would have done it, but $400+ for a entry-level kit is just too expensive. Genuinely curious if you really save money by using aluminum – maybe it is easier to mold and manufacture?